I’ve been receiving many inquiries regarding my whereabouts. I’m currently on vacation, enjoying the arrival of my first grandson and my new role of Grandmother. When I resume my writing, the articles will appear exclusively here on my blog. 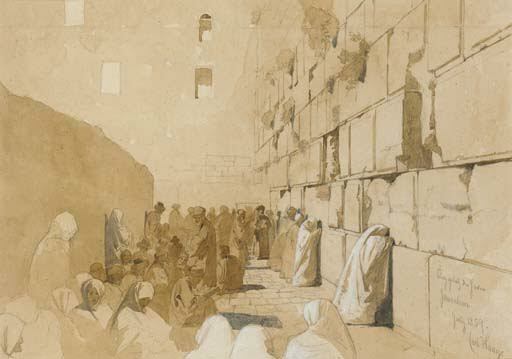 Jews praying at the Western Wall – an 1859 painting by Carl Haag. All UN institutions serially test our sanity – very sorely so. UNESCO – the gallingly misnamed “educational, scientific and cultural” arm of the dysfunctional organization – managed to barely brake at the brink of bedlam, but only just and only for now. At the very last minute it let go of a plan to pronounce the Western Wall a Muslim holy shrine, an integral part and parcel of the al-Aksa Mosque compound. That presumably would have accorded Muslims international sanction to bar the Jews from Judaism’s holiest site – the remnant of the great Temple, in front of which for 2,000 years Jews bewailed the Temple’s destruction, the loss of their sovereignty and their ongoing tragedy. So pivotal a Jewish site was to be consigned to Islam because of a Johnny-come-lately tale that Muhammad tethered his winged steed Burak there on a mysterious mythical midnight flight.